I was chatting with an acquaintance the other day, who knowing how fanatical keen I am on small houses, told me that he and his wife are planning on building a tiny house. Not small — tiny. 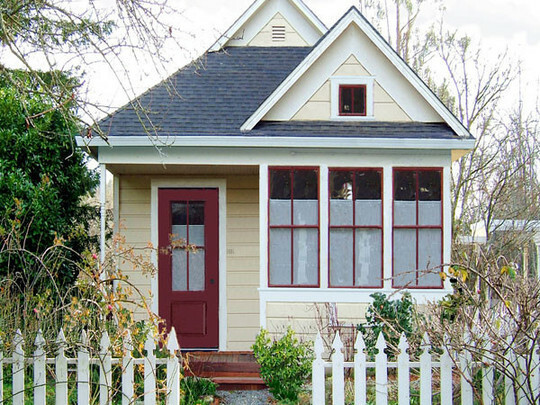 One of the houses that fit snugly into the Tiny House Movement, at under 120 square feet. Currently they are renting a nice condo in Vancouver. 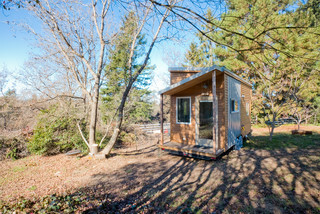 The tiny house (on wheels) would sit on his in-law’s property out in the Fraser Valley, and would serve as their quarters as they help her parents renovate their home. If the home is then sold, they would just roll the home onto some recreational property, or onto a corner of the subdivided property. Or they might just decide to move out there and stay. It’s the perfect solution to their current dilemma, although presently they are not planning to live full-time in the home. 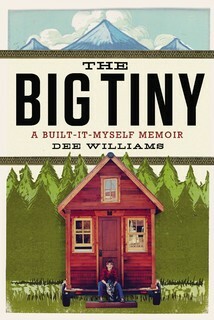 Dee Williams has lived for 10 years in just 84 square feet. It’s an accomplishment, to be sure, one worthy of having a book written about her experience. Like this one. Which she wrote. Williams used to live in a much bigger house. With a big mortgage and big heating bills. But a life crisis made her realize what was really important — and she turned her life around and put it into a tiny house. She realized what her true priorities are. Dee’s story has been told here in Houzz, and here. And she’s given a TED Talk on it. It’s a big story (about a tiny house). Tiny houses come in a surprising variety of designs. This couple has a luxuriant 240 square feet in a space no wider than 8 1/2 feet and no taller than 13 1/2 feet. What makes tiny houses so liveable? The blog Tiny House Talk has some suggestions to get the most spaciousness (if not space) in your tiny home. Keep the space uncluttered above waist height. Anything above waist height that projects into the living space will make the space feel that much smaller. That means kitchen base cabinets are not a problem, but upper cabinets might be. Limit cabinets, shelves, or anything else that intrudes into this space. Use light colors to create a spacious feeling. Light colors make a space seem bigger, while dark colors make a space seem smaller. Choose white or light-colored finishes for the ceiling and walls. (The floor color is less important for this purpose). In most of the tiny houses I have seen have seen the ceiling and walls are all the same light colour, so your eye travels from the walls up to the gabled roof without interruption. Open up to the outdoors. In addition to windows, think of creative ways that doors or even whole sliding walls could allow you to open your house up. (Check out the Virginia Tech LumenHaus for one elegant example). With a porch, deck, and a whole landscape outside, your tiny space won’t feel at all claustrophobic. I know that just having our deck outside the upper floor of our laneway makes the entire storey seem larger. 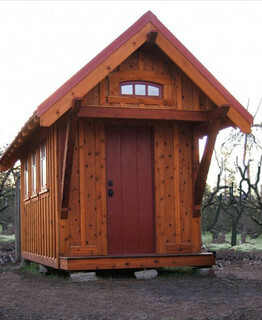 There’s no doubt about it—downsizing and simplifying your life to fit in a tiny home is a very difficult thing to do. And you certainly will want some storage space, partitions, and so on. But beware of the “big house mentality” in which a room can be packed with cabinets, bookshelves, and furniture and still feel spacious. In a tiny house, it can’t. Restraint, and a little bit of good design, will go a long way towards making your small space feel plenty comfortable. And as DH has pointed out several times, Good Design Trumps Space. Posted in Housing, Minimalism, Tiny House and tagged Laneway House, Small House, Small Style, tiny house. Bookmark the permalink. Yes, we are moving into a tiny home, and yes, we are happy to do it. It’s not for everyone, but is it for you? Would you put your money where your future house may be? Ian Kent thinks his Nomad Micro Homes could be one of the answers for densification in our city — plus the solution for other housing problems. “Less House More Home” is their motto and they have a 160 square foot house for you…for just $25,000 to $28,000. Great for a summer house, a guest house, a studio or even your main house (if you live a minimalist life). Posted in Cities, Housing, Minimalism, Small House, Tiny House and tagged Lane Home, Lane house, Laneway House, Small House, Small Style, tiny house. Bookmark the permalink. Living small is certainly not a new idea. But in the US, the housing crash of about 5 years ago really made people think about buying more house than you need (or can afford). If you’re interested in living small in America, this site has listings for some nice little homes. Interested in a vacation home in Arizona? Florida? California? If you’re honestly interested in the tiny house movement be sure to check out Tiny House Talk for great ideas. Posted in Housing, Small House, Tiny House and tagged Small House, tiny house. Bookmark the permalink. Be sure to be listening to the Home Discovery Show tomorrow morning. I’ll be talking to Ian and Steve about our building of the laneway home. I visit every couple of weeks — and I love the intro they’ve made for “my” segment! Posted in Laneway House, Small House, The Home Discovery Show, Tiny House and tagged Lane Home, Lane house, Laneway House, The Home Discovery Show. Bookmark the permalink. Good bye to all that…..
Others have gone before us, and show us the way. the complicated process of extricating ourselves from our possessions. And that’s what it’s all about, isn’t it? When we hold on to “things”, no matter how precious they seem to us at the time, we are owned BY them. But most advice I get on how to de-clutter seems to be geared to clearing the mess that we can see — hiding away the untidyness and detritus of our lives. But we want to get rid of it. Forever. Banish it from our lives, so we can live so much more simply. That’s why I like what Laura Norcross has to say about winnowing her wardrobe at Tiny House Talk. It’s a process. Do it once, twice, how many times you need to say good-bye to things that you don’t need any more. Good advice for our new lives, not just our new living space. Posted in Decorating, Laneway House, Tiny House and tagged Lane Home, Lane house, Laneway House, tiny house. Bookmark the permalink. I admire people who need less than I do. There is almost a Zen-like approach to living that comes with living with very, very little. These Tiny Houses featured in this Apartment Therapy story prove that you can do more with less. And they’re so cute, too! Posted in Tiny House and tagged tiny house. Bookmark the permalink.